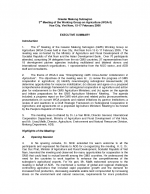 The Third Meeting of the GMS Working Group on Agriculture was held in Hue City, Viet Nam on 15-17 February 2006. It was jointly hosted by the Asian Development Bank (ADB) and the Socialist Republic of Viet Nam. The theme of the meeting was "Strengthening GMS Cross-border Collaboration in Agriculture." Over 70 participants, including 34 delegates from the six GMS countries, 27 representatives from 18 development partner agencies including multilateral and bilateral donors and international research organizations, civil society, and ADB attended the meeting.